A photo essay of a trek in Sapa, Vietnam. Includes hill tribe villagers (Hmong, Black Hmong, Red Dao people) and terraced rice fields just southwest of the Chinese border. 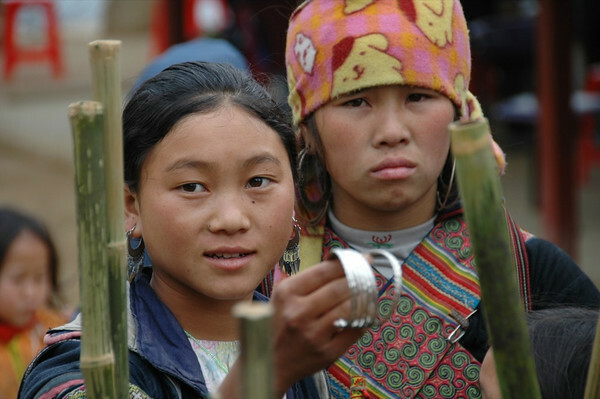 Read more about the hill tribes and trekking in Sapa. 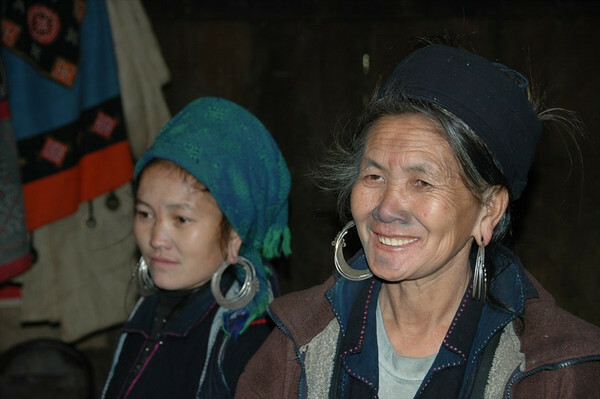 The Black Hmong women are identified by the dark indigo color of their clothing which stands in contrast to their accessories and brightly-colored embroidery. Their legs are wrapped with a velvet type cloth to keep them warm in the winter months. Hmong have high cheekbones and broader faces, in comparison to the Vietnamese. 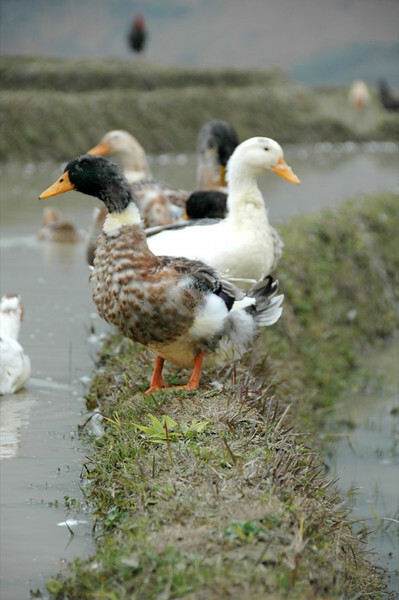 It is believed they migrated to this region from southern China in the 18th century. Within the general Hmong ethnic group, there are several subdivisions - Black Hmong, White Hmong, Flower Hmong, among others. Read more about the hill tribes and trekking in Sapa. 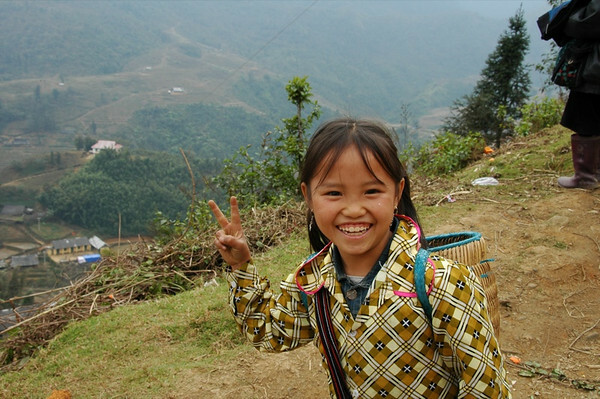 No escaping the peace sign in Southeast Asia, especially Vietnam, and most especially in Sapa. Characteristic of Sapa are the village girls who attach themselves to trekking groups, chatting and joking in astonishingly fluent English. They even know jokes and idioms. Many don't go to school, but pick it up from talking to foreigners! This girl accompanied us on our first day of trekking. Often, their hope (expectation?) is that at the end of the day you will buy something from them. 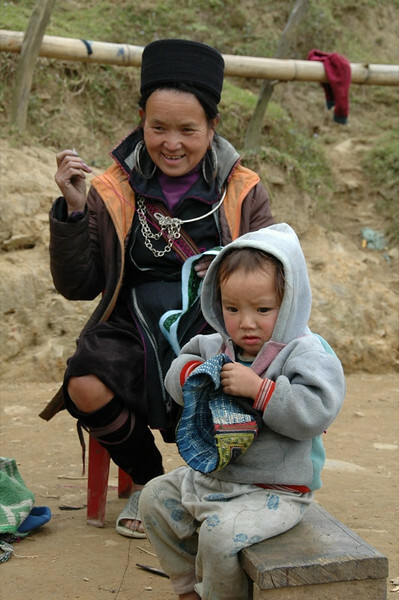 Read more about the hill tribes and trekking in Sapa. In the village of Cat Cat outside of Sapa, we were invited into the house of a Black Hmong family. 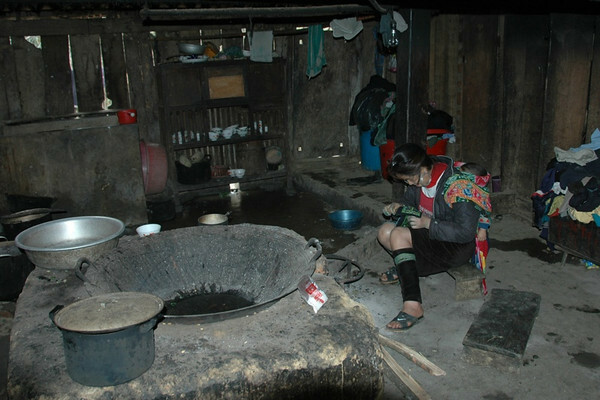 The cooking area is in the middle of the house; a young woman embroiders while her baby sleeps on her back. 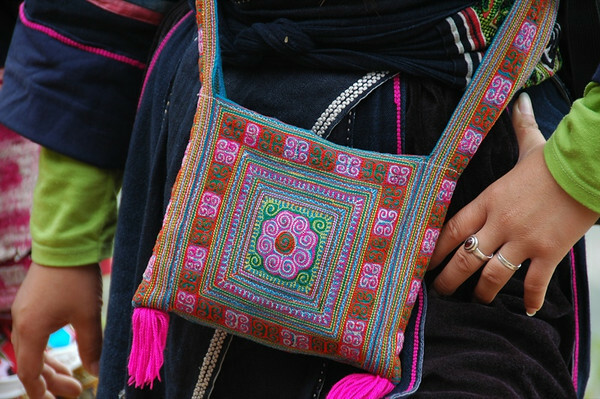 Black Hmong are known for their dark indigo dyed cloth and brightly-colored embroidery. 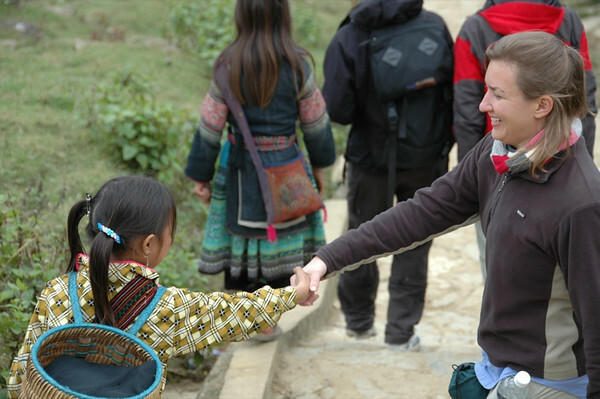 Read more about the hill tribes and trekking in Sapa. We're not sure, but the woman behind the boy may be his mother. It was very difficult to tell the age of people in this region - life can be difficult thereby accelerating the aging process, but the fresh air and natural environment sometimes provides a youthful counter-effect. One of the games people play to engage you in conversation is to guess your age, and then for you to guess their age....that can get tricky sometimes. 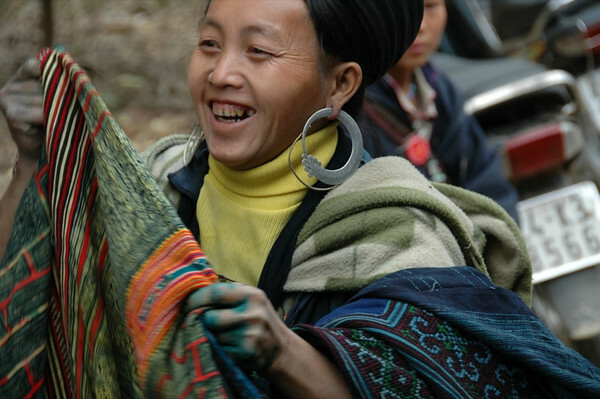 Read more about the hill tribes and trekking in Sapa. Typical scenery of the Sapa region - hills, terraced rice fields, and dots of small villages. The rice had been planted already, but the main harvest is still months away. We'd love to see this region when it's ready for harvest and the hills are bright green. 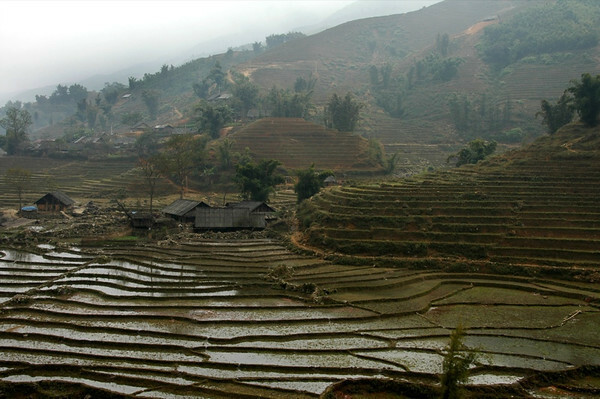 Read more about the hill tribes and trekking in Sapa. The women of the house were dyeing cloth outside when we arrived. Large vats of indigo dye and meters of dark cloth lined the house. The women make hemp cloth by hand. The indigo dye, extracted from flowers, easily stains the skin. Read more about the hill tribes and trekking in Sapa. Sue was one of the girls who walked with us the first day through Cat Cat village. She was fiesty and quick on her feet (mentally and physically). If any girl from Sapa makes it to Hollywood, it will be her. Read more about the hill tribes and trekking in Sapa. Even though you know the kids are walking with you for business reasons, they are pretty funny and very creative. 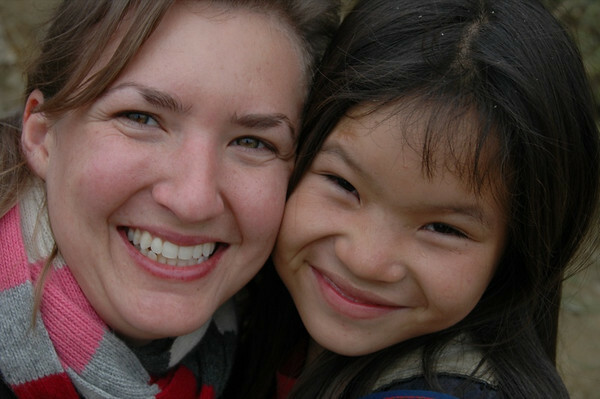 Audrey and a Hmong girl make a deal: I won't buy something from you if you don't buy something from me. 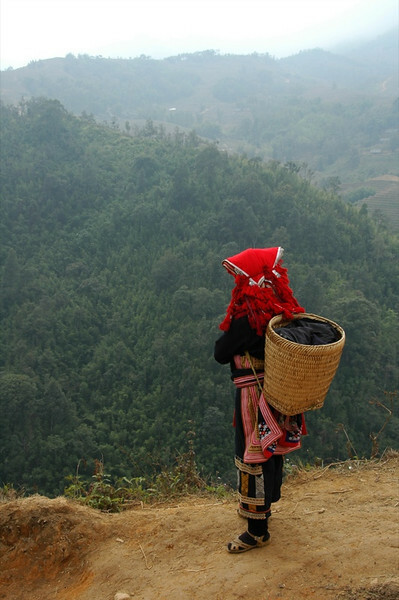 Read more about the hill tribes and trekking in Sapa. An example of a hand embroidered H'mong purse. The colors and designs are mesmerizing. Read more about the hill tribes and trekking in Sapa. As we made our way back from Cat Cat village to Sapa, we came across a group of Red Dao doing embroidery along the road. This group is are known for their bright head scarves. Their colorful goods are displayed in front of them, and the muted hills of Sapa are behind. Read more about the hill tribes and trekking in Sapa. We found this boy by himself on the roadside in his hat, shirt and galoshes. In the time that we spent trying to engage him, we didn't see anyone else. We felt guilty just leaving him there on the roadside, but he seemed to be in the right place somehow. 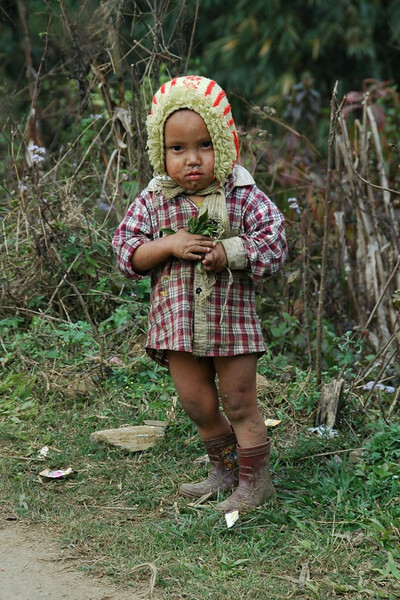 Read more about the hill tribes and trekking in Sapa. Dogmeat is considered a delicacy and good luck in this region, so seeing full-grown and well-groomed dogs was a rarity. 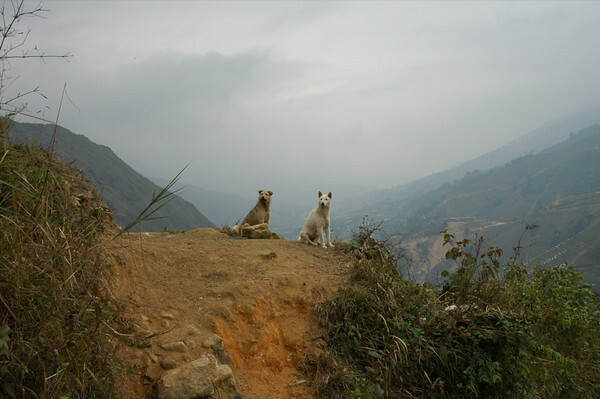 These two seemed to act as sentries along the mountain pass. 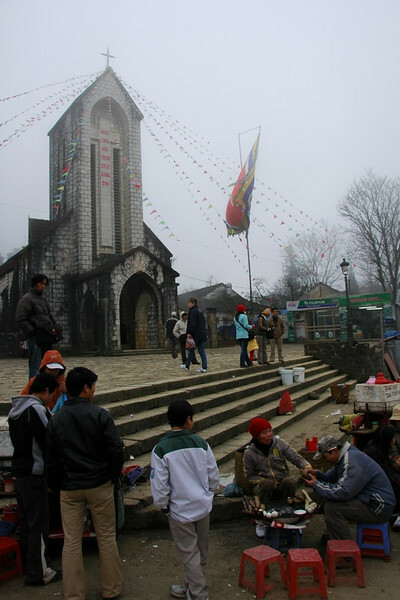 Read more about the hill tribes and trekking in Sapa. We were told later on that the priest here died not too long ago, but the authorities didn't want him replaced. So, the townsfolk and villagers come to church every Sunday, but they run the ceremony themselves based on memory and the few books they have. The church is in a main town square, so there are street restaurants and street stalls all around. 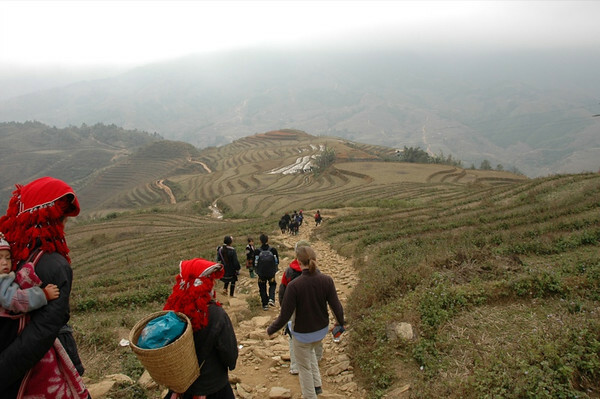 Read more about the hill tribes and trekking in Sapa. The goods on offer at a road-side stand on the second day of our trek, just before we descend into into the valley. Read more about the hill tribes and trekking in Sapa. 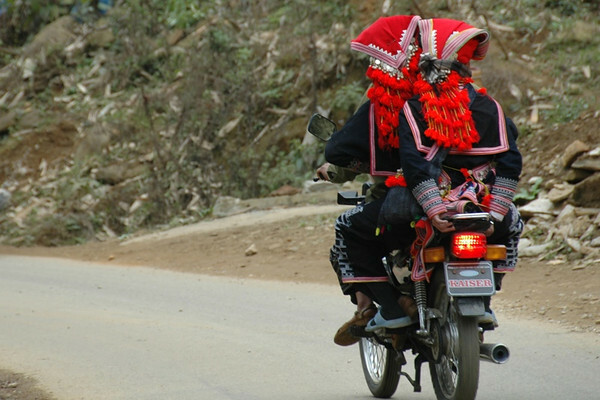 Two Red Dao women make their way home by motorbike. Many of the villagers live quite a distance from the town of Sapa, meaning that they can either walk for hours or pay the $1-$2 for a motorbike to take them home in a fraction of the time. The decision often comes down to how the day went at the market or how much was sold to tourists on the road. Read more about the hill tribes and trekking in Sapa. This woman latched onto our group at one of the stopping points and was trying to befriend us in the hope to sell us something at the end of the day. We weren't in a shopping mood since we were going to Bac Ha market the next day. Audrey's attempts to communicate this to avoid the inevitable disappointment and guilt trips didn't work too well at first. Eventually, however, the woman made the smart business decision and found another tourist group where she had much better selling odds. Read more about the hill tribes and trekking in Sapa. As we walked along the dirt path into and out of valleys, we followed our Hmong guide in a bright pink hat, as the Red Dao women and Hmong girls followed us. Quite a procession! Read more about the hill tribes and trekking in Sapa. Read more about the hill tribes and trekking in Sapa. 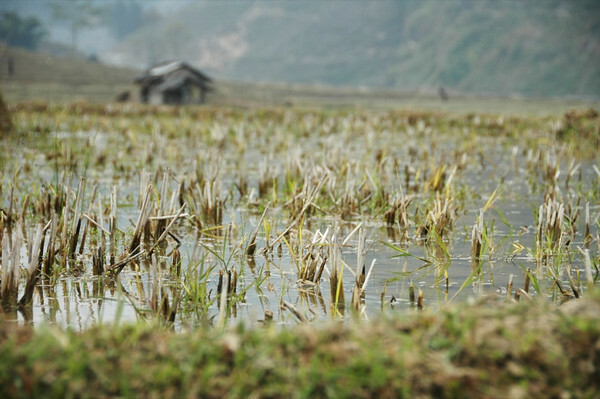 When we were in Sapa in January, rice had just been planted. The water from the mountains serves as irrigation. The area will turn from muted tans and browns to a dazzling green as the rice approaches harvest time. 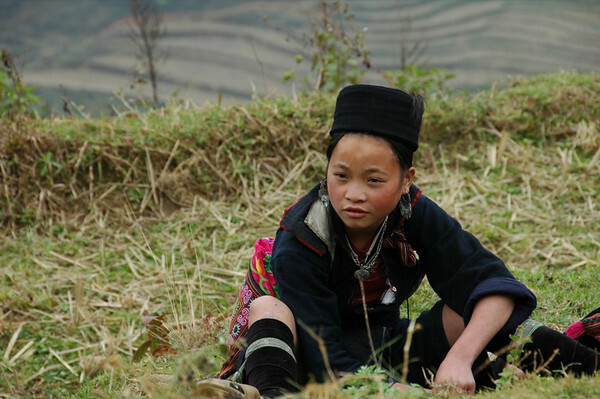 Read more about the hill tribes and trekking in Sapa.